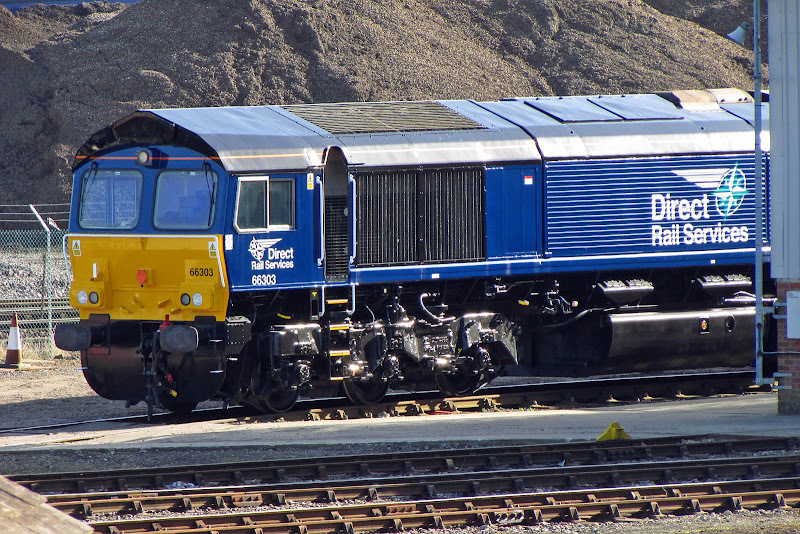 Newly repainted 66303 awaits collection from the works. 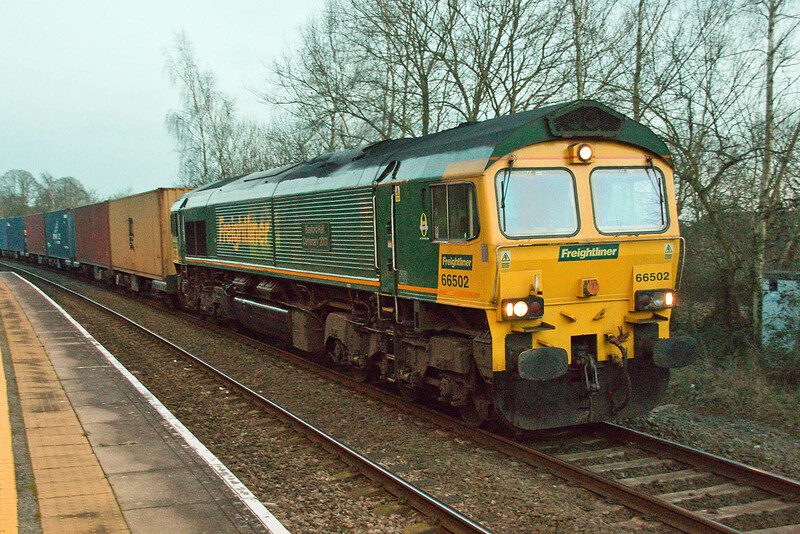 Will 66304, last 66 in traffic in 'DRS Compass', work south on Wednesday 1st March for its repaint? 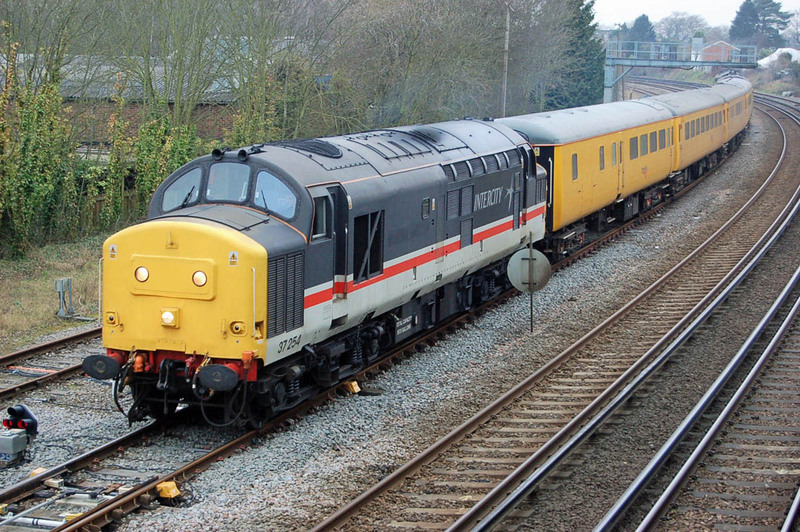 37405 and coach 5919, which can be seen in the background of the 2 lower images, were moved from Norwich to Eastleigh on Tuesday 21st. 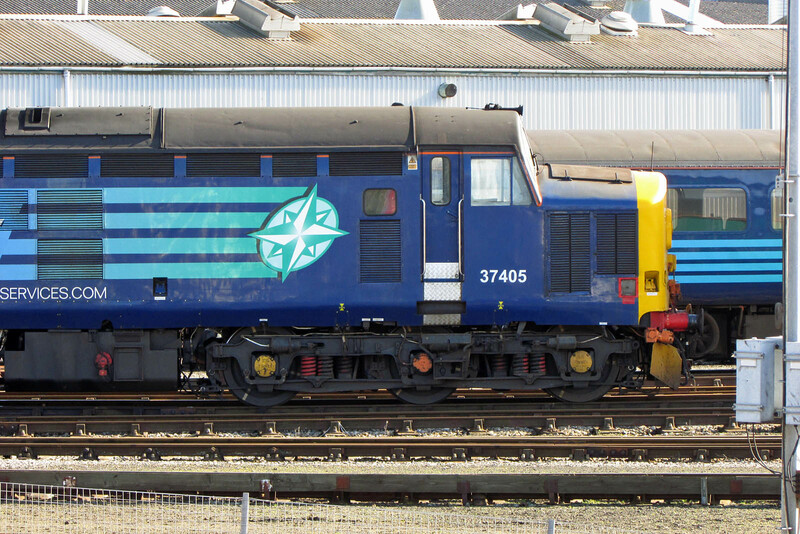 While 37405 may be ready for a repaint into the newer DRS scheme, it may also have been receiving maintenance attention, although it was in traffic in East Anglia in the previous week. 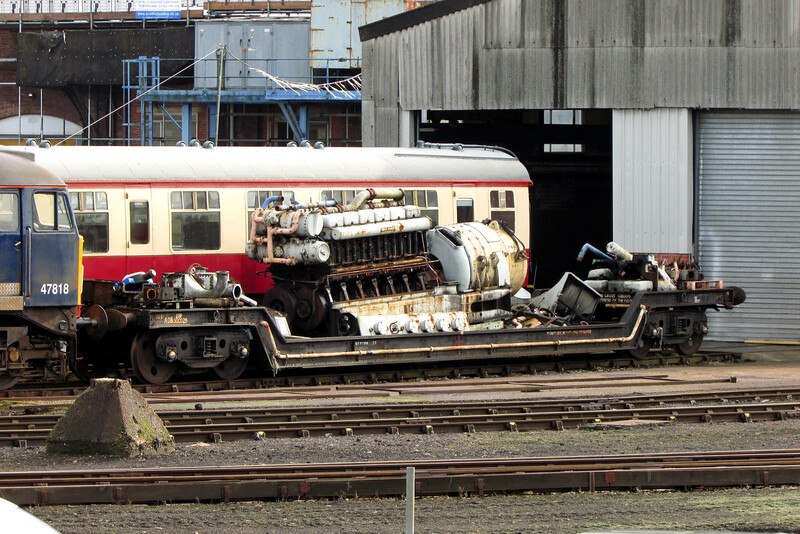 The engine was run up at Eastleigh on Friday, after these pictures were taken. 37405 was new as D6982 on 13th May 1965, allocated to Cardiff Canton, renumbered 37282 in March 1974. Heavy General Overhaul at Crewe November 1984 - September 1985 emerging as 37405 for the ScR, named Strathclyde Region in April 1986. EWS stored the locomotive at least twice between March 2006 and December 2010, after which it was sold to DRS in January 2011, and moved in May 2012. 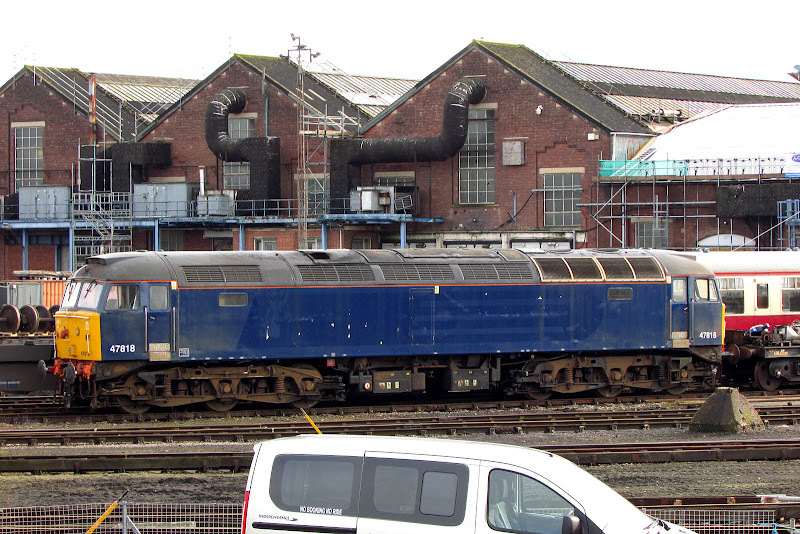 Ex-works at Barrow Hill in January 2013, reaching this area on a railtour on 30th November that year. Looking further back, at Shawford, on 10th September 2006, 37405 is returning "Wessex" railtour stock 5Z84 12:50 Eastleigh - Old Oak Common, following a tour to Penzance on the previous day. 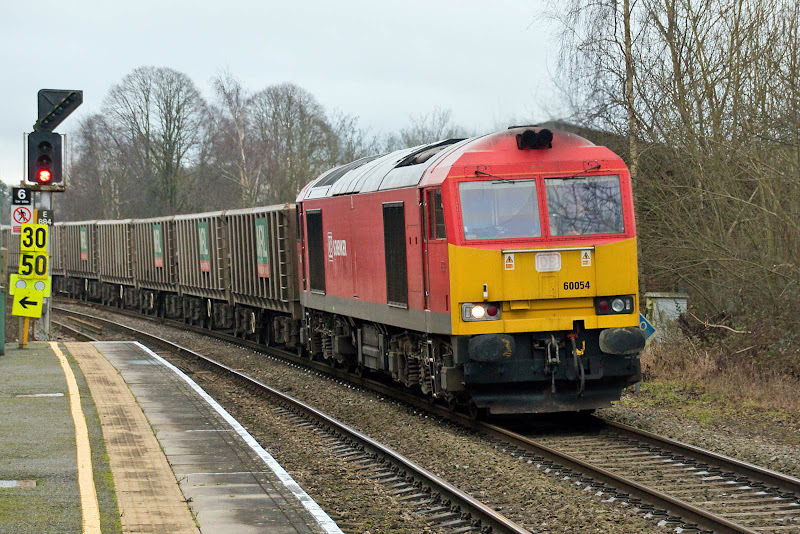 66502 passes Romsey with 4M97 17:32 Maritime - Hams Hall on Friday 24th February. 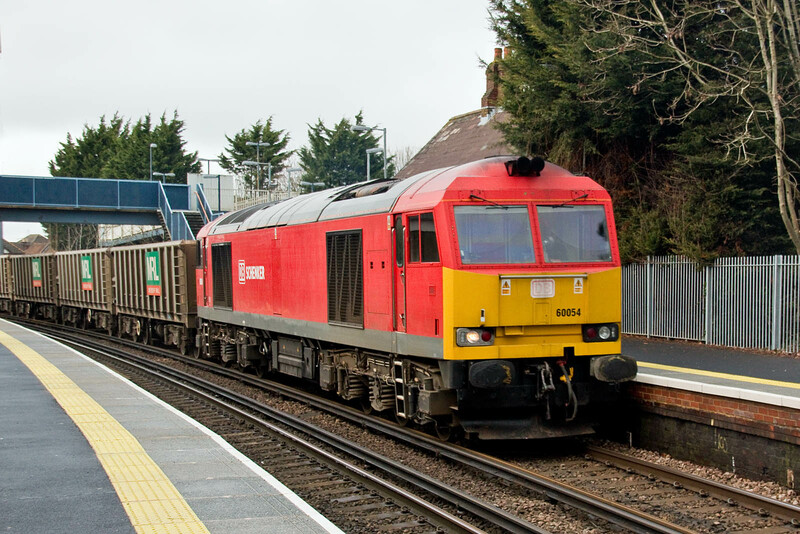 70806 passes through Romsey slowly as 0O31 17:30 Westbury - Eastleigh. 70812 is on a ship which has docked at Liverpool late on Friday - now unloaded. 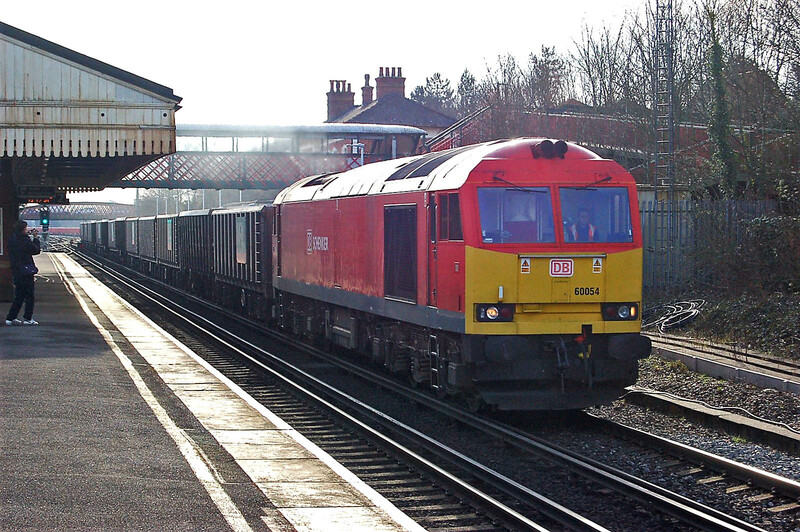 70806 was halted at the signal, which was then cleared for the Redbridge branch. 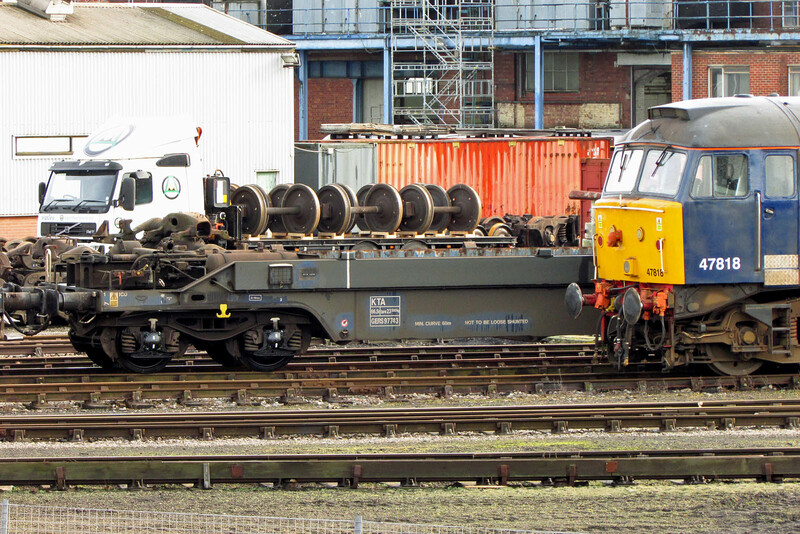 Wednesday 22nd February: 08904 moved to Eastleigh Works, Raxstar owned 08879 was de-fueled at the Works. 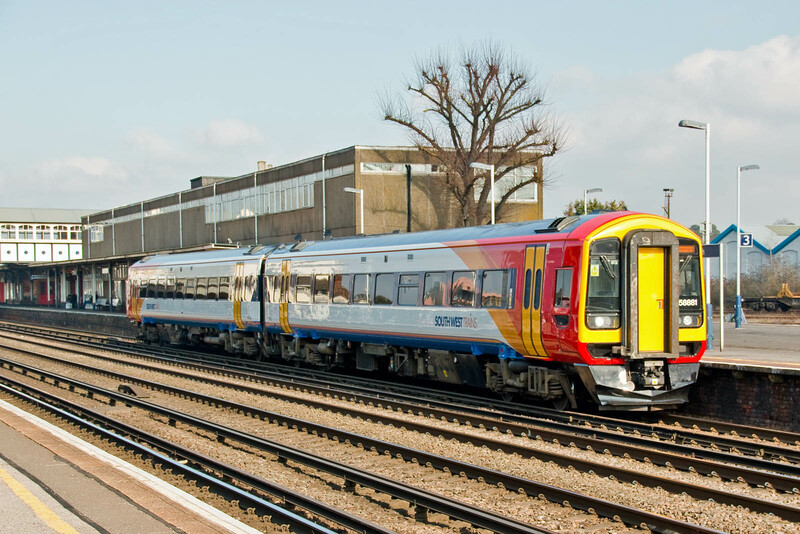 158881 has been refurbished and re-liveried, the 2nd of the 158/8's following 158880. 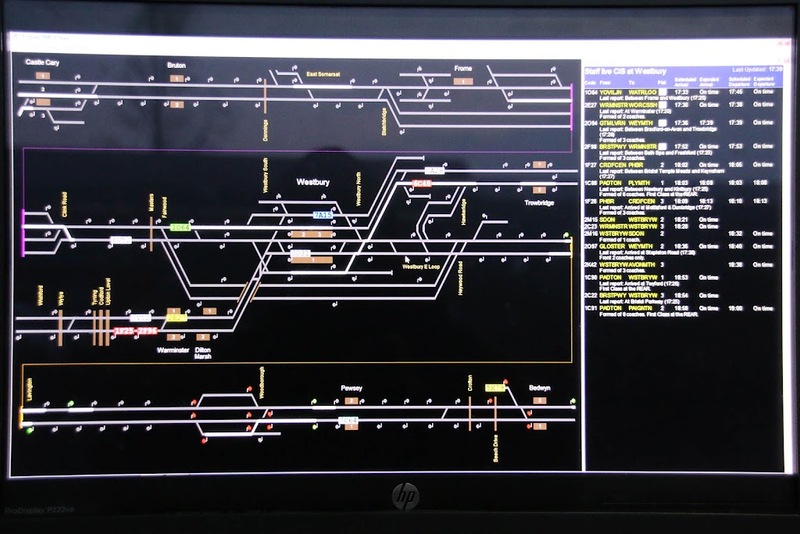 It went to Brush at Loughborough on 24th December, and was released on 9th February. 70018 was on local duties bringing flats from Maritime for weekend storage in East Yard. 70010 with 4O90 05:27 Leeds - Maritime. 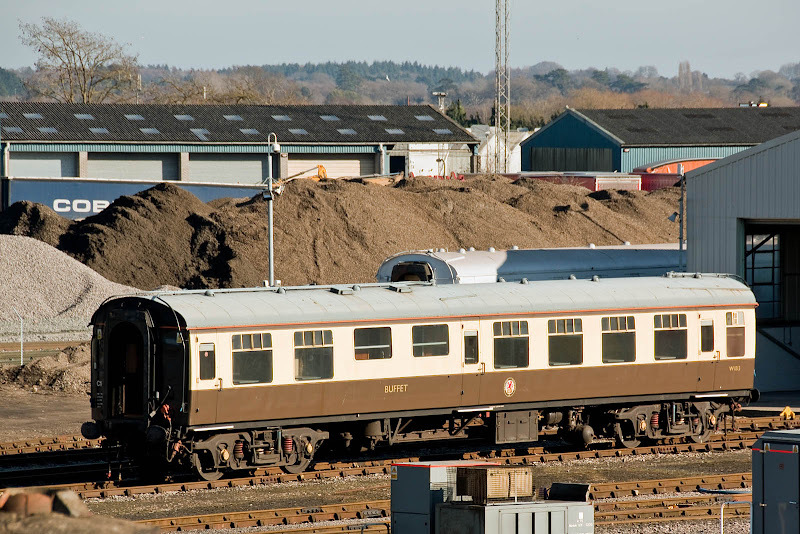 RMB 1813 was built at BR Wolverton to Lot 30520 entered traffic in March 1960, and came out of regular traffic in July 1992. 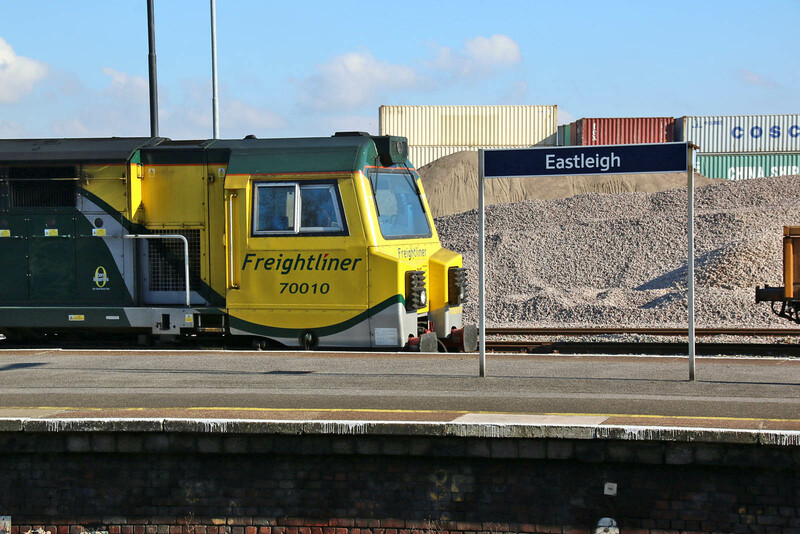 57011 has been in storage since June 2016, and was moved to Eastleigh Works in January to swap bogies with 57308. [Update: they may have been swapped with 57303.] 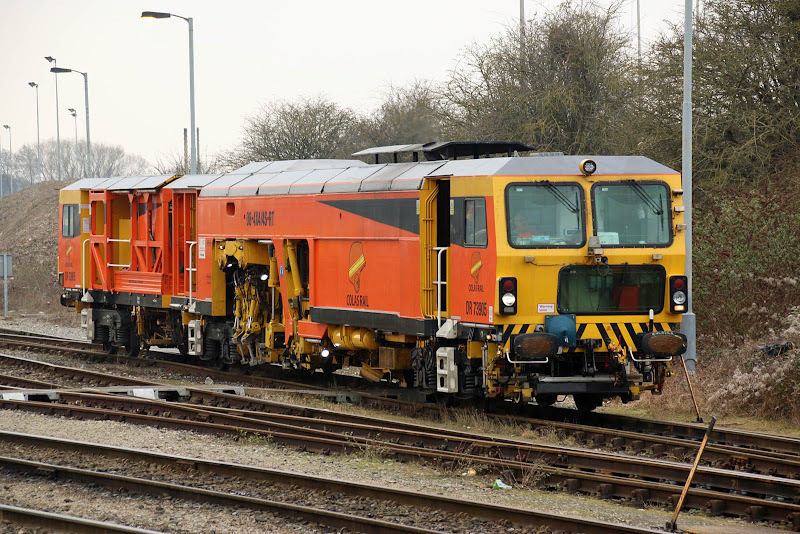 It arrived along with 57303, also seen in this picture. This locomotive was new as D1810 in February 1965 to D16 Toton. 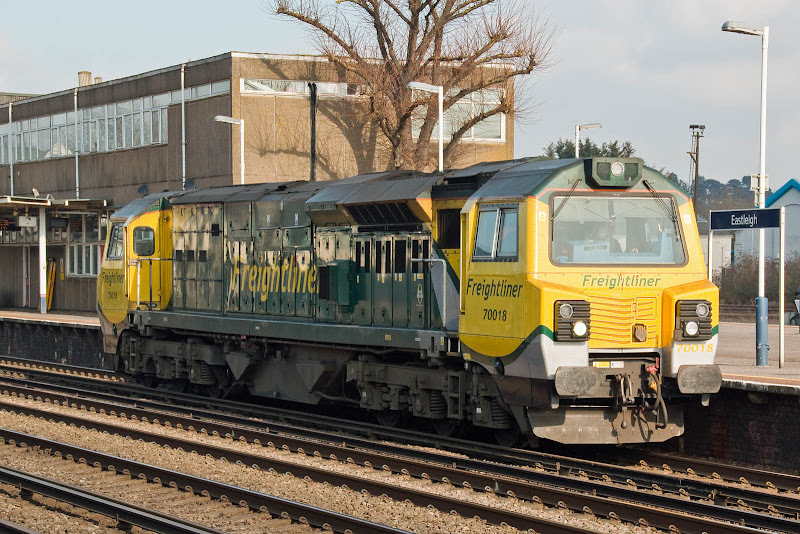 In May 1974 it became 47329, then rebuilt to 57011 in March 2000 for Freightliner. 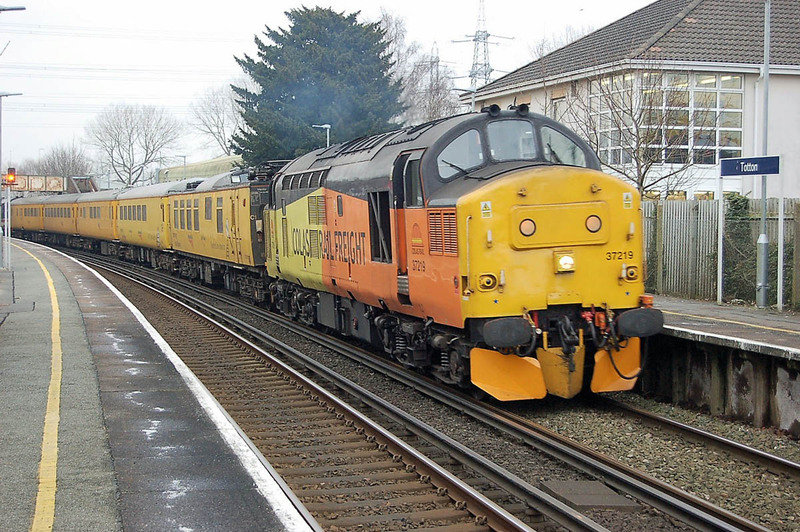 37219 with 1Q52 at Totton, 14th February. The first coach is the former 'Mentor' 975091. Image by Ian Knight. 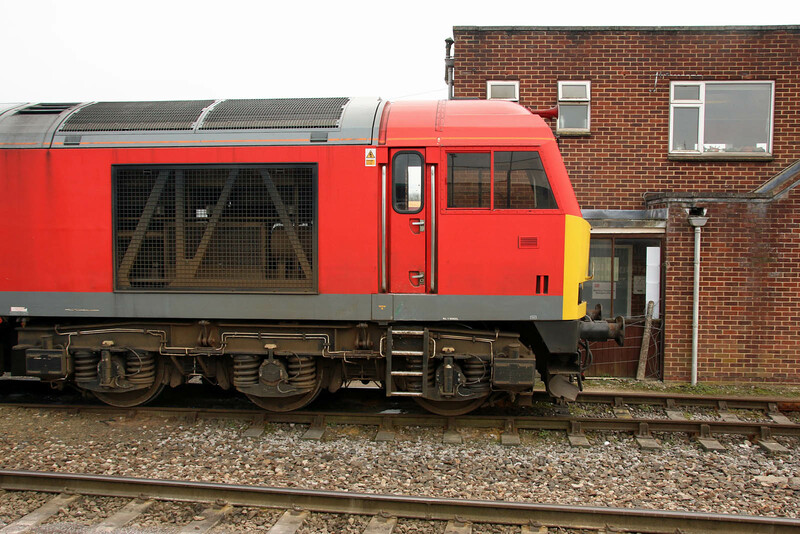 37254 at Totton Yard with the same train. Image by Ian Knight. 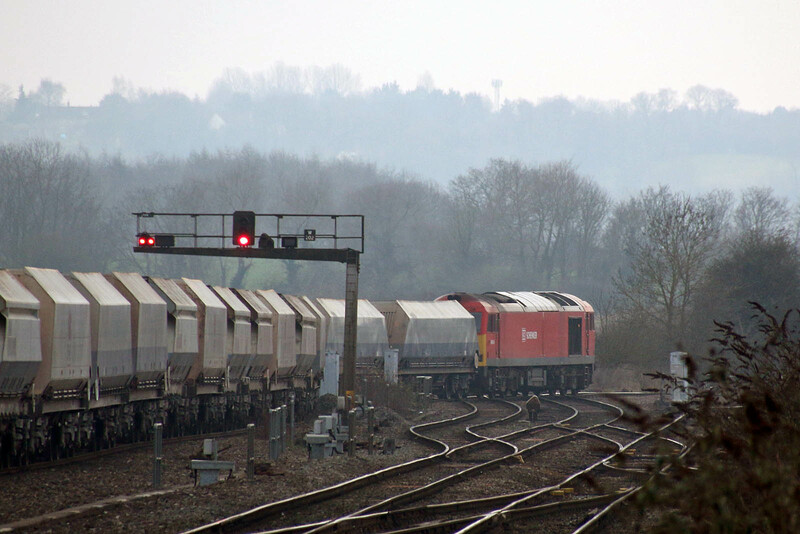 60054 passes St Denys on 17th with7V52. Image by Ian Knight. 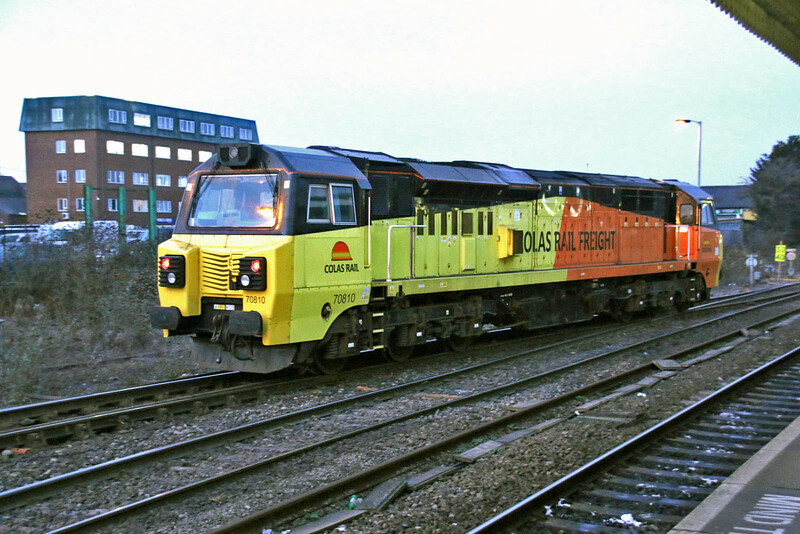 70003 has been returned to an active pool, but is still at Leeds Midland Road, and 70016 is now in store. It is believed that there are problems related to both availability of wheelsets, and maintenance resources, for Class 70s at Leeds. 59102 Village of Chantry (GM EMD Nov 1990) arrives with the empties, having been held for some time outside of Westbury. 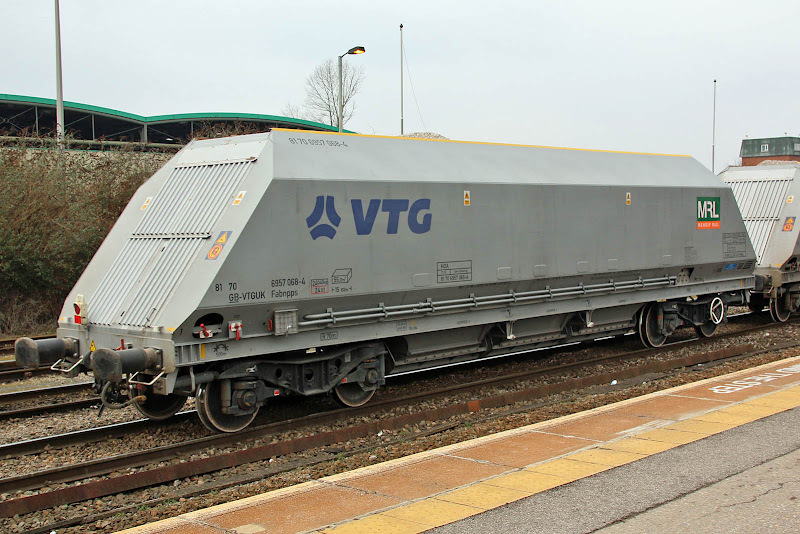 The consist was exclusively these new JNA wagons, from Astra in Romania, and with design similarities to the recently delivered DBC MMA's - no side door (clean out hatch) and two more pillars per side. 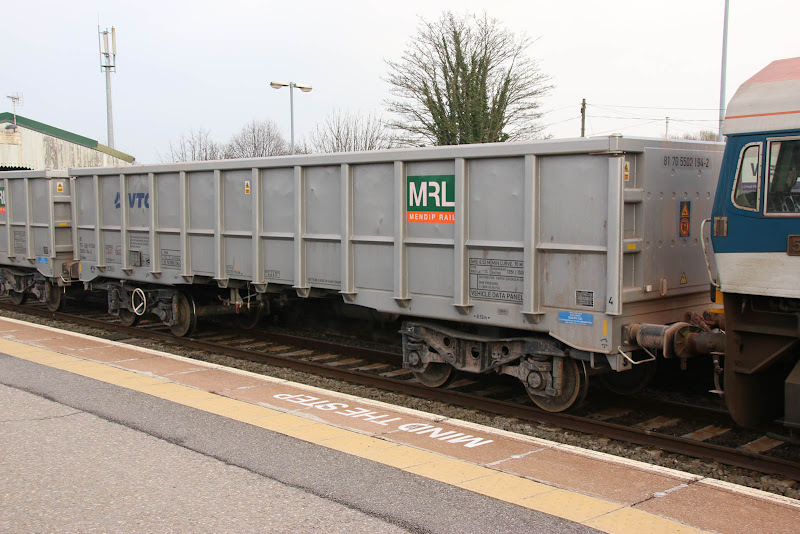 The first wagon is 81 70 5500 194-2. Here is 81 70 5500 216-3. 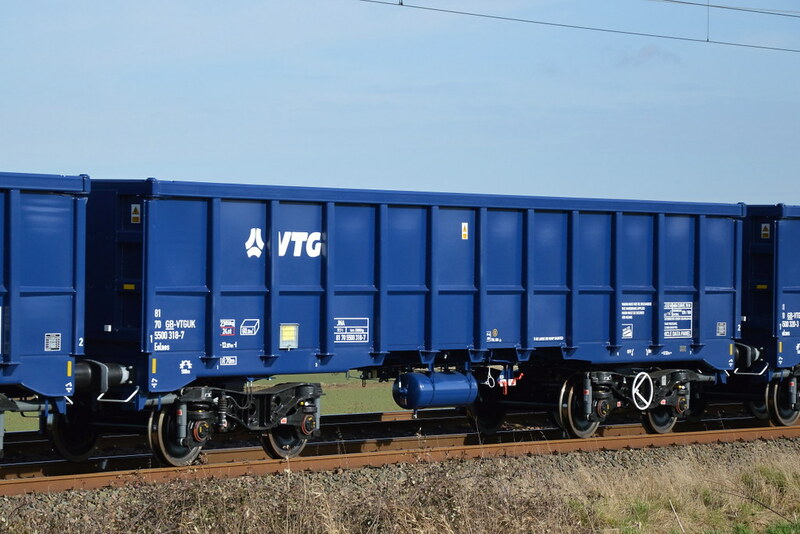 The number series for these JNA Ealnos boxes currently delivered goes up to '292', with allocations up to '378' although this involves other fleets. Hiveminer can see '318'. 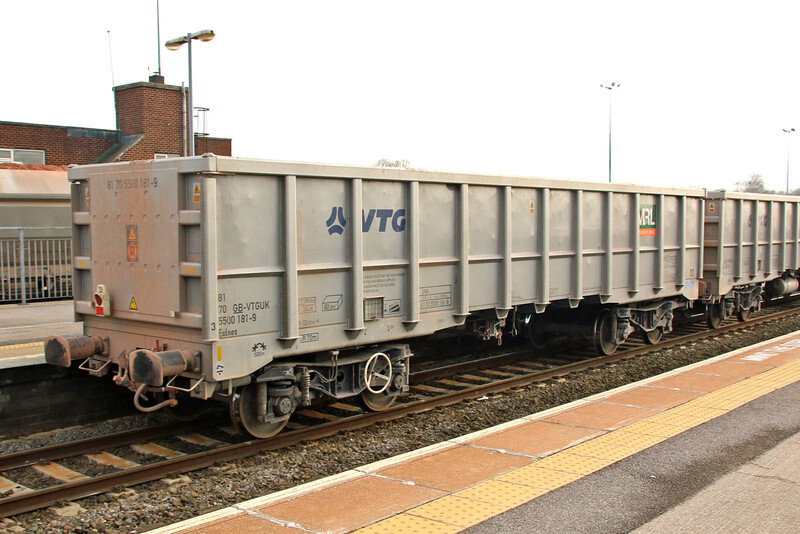 The last wagon was 81 70 5500 181-9. 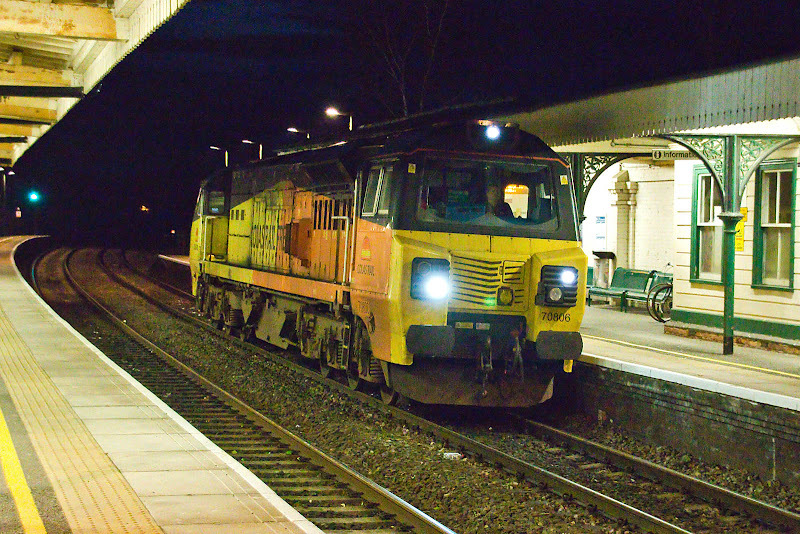 59206 John F Yeoman Rail Pioneer leads the train into Westbury. 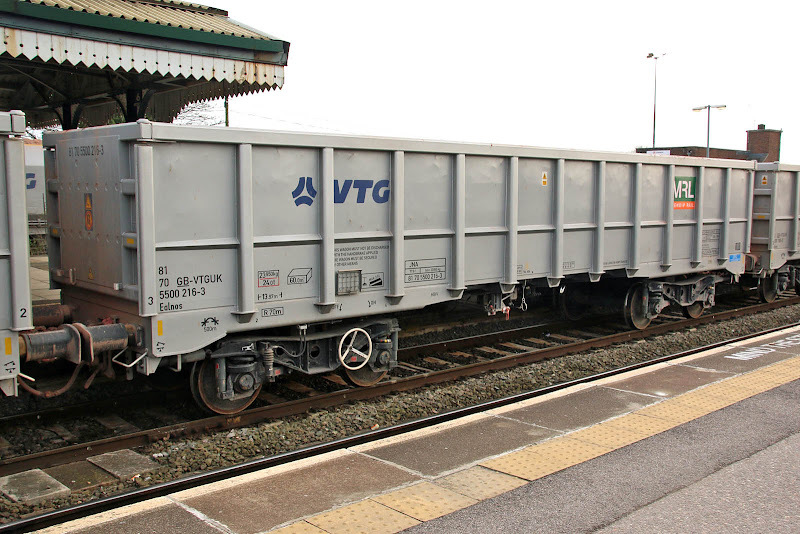 The new HOA Bogie Aggregate Hopper wagons are leased from VTG and are dedicated to Mendip Rail service. 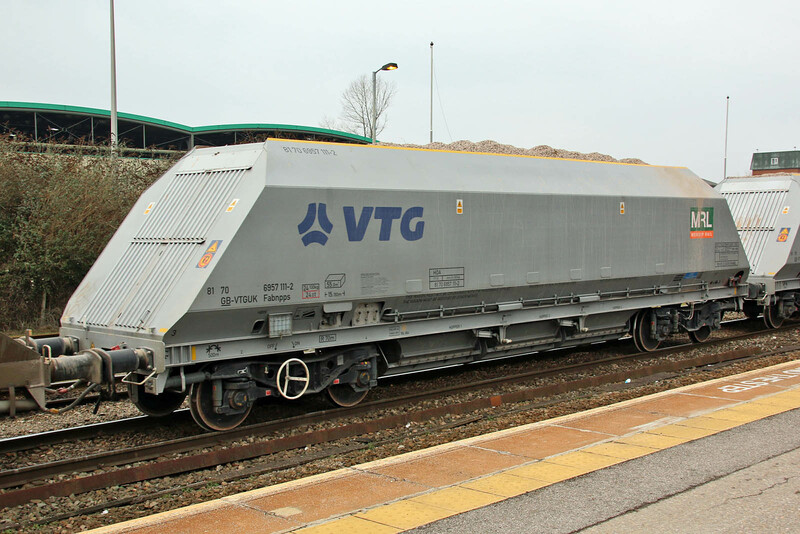 81 70 6957 111-2 was built by Astra Rail in Romania in 2016, being delivered in the September period (the lot runs up to number 115). Similar 81 70 6957 068-4 on the rear of the train. Plasser & Theurer 08-4x4/4S-RT Switch & Crossing Tamper DR73905 (works number 1095 of 1998) running as 6J44 14:10 Westbury - Exeter Old Yard. 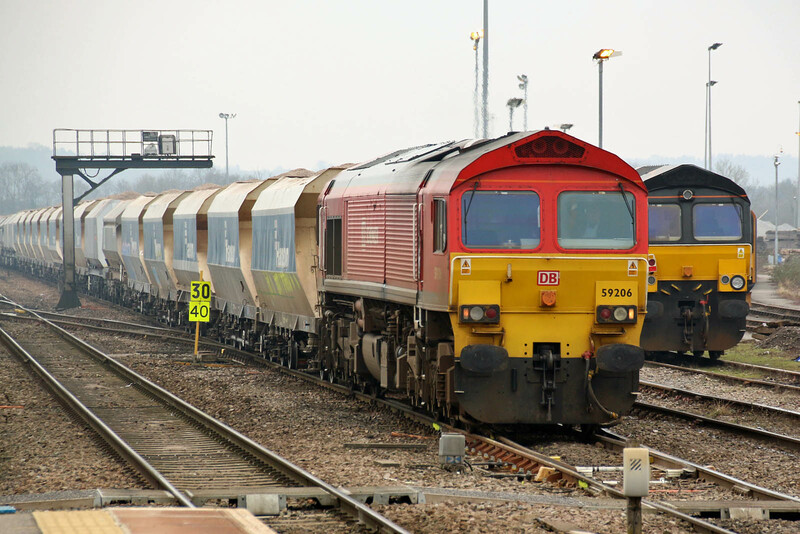 Three class 70s, led by 70810 were at the stabling point. 70809 arrived with 7C28 13:45 Exeter-Whatley, which was re-marshalled and worked forward by 60054. 37057 departed at 17:03, 23 minutes late, with 1Q06 16:40 Westbury - Weymouth - Woking. 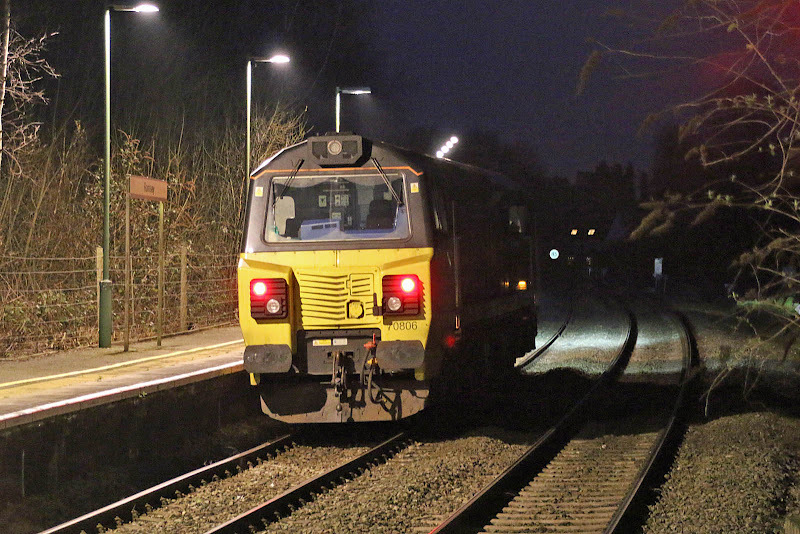 70810 departs at 17:29 as a delayed 0A28 1700 Westbury - Hinksey. Friday morning, and decisions to be made - to Hamworthy if 60054 was on the stone train, else to deepest Wiltshire. No clear info for Hamworthy was to be had before leaving home, so off to Wiltshire it was, and noted 60054 on the down side at Westbury in passing. Returning in the early afternoon found 60054 on the up side, crewed by three, and in use as a supershunter. 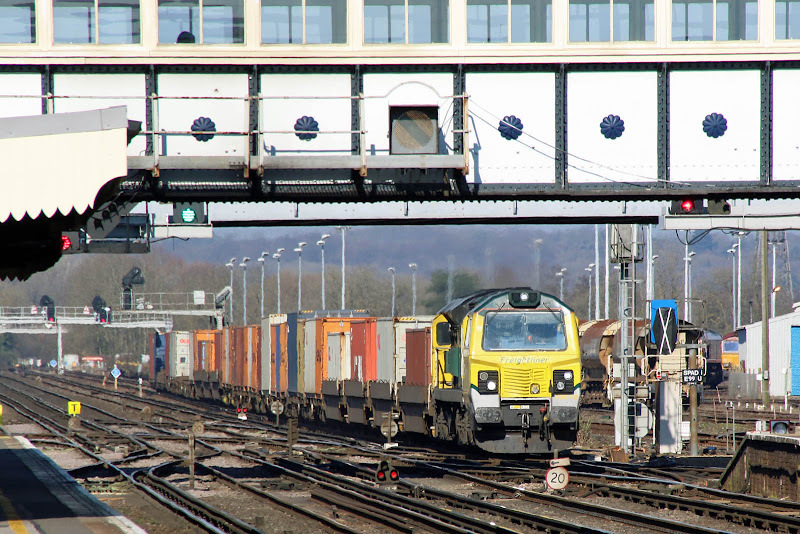 13:35 - 60054 on the up side at Westbury. The drive is ready to move away in the down direction. 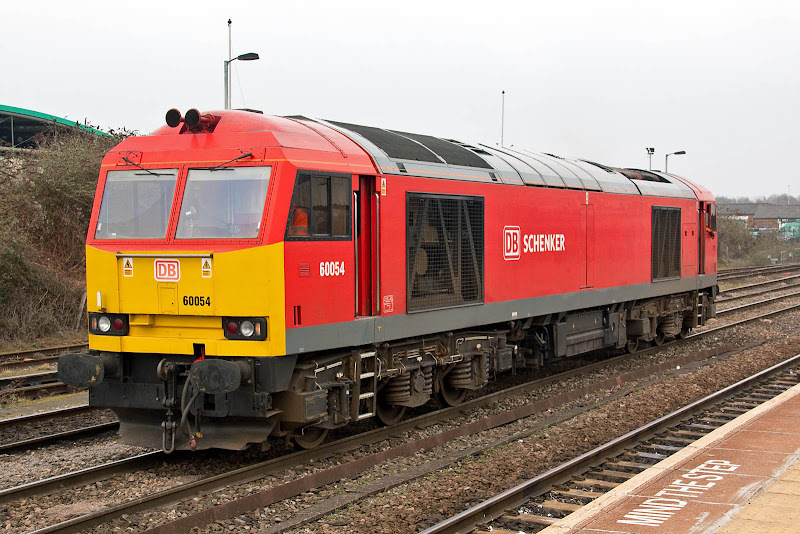 13:51 - 60054 was moved to the up side, initially on a short brake adjacent to the DB Cargo office. 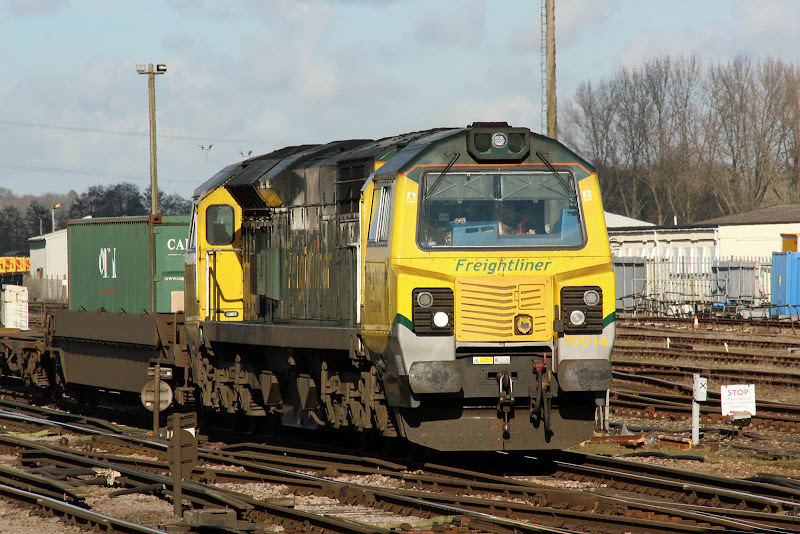 At 14:20 the locomotive was moved to the yards, and was involved in shunting of the 7O40 13:35 Merehead - Eastleigh, which arrived behind 59001 with some wagons taken off into the yard. 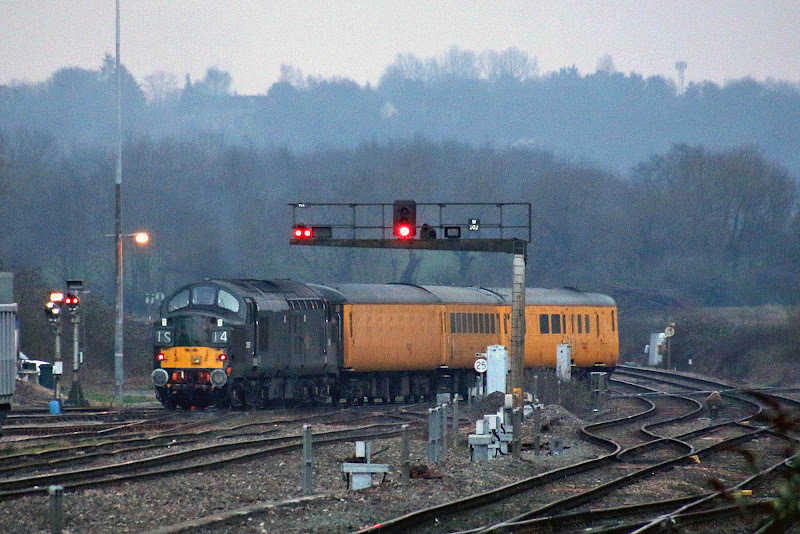 Later (15:56) 70809 arrived on 7C28 13:45 Exeter - Whatley, the Colas locomotive covering a turn for DBC. 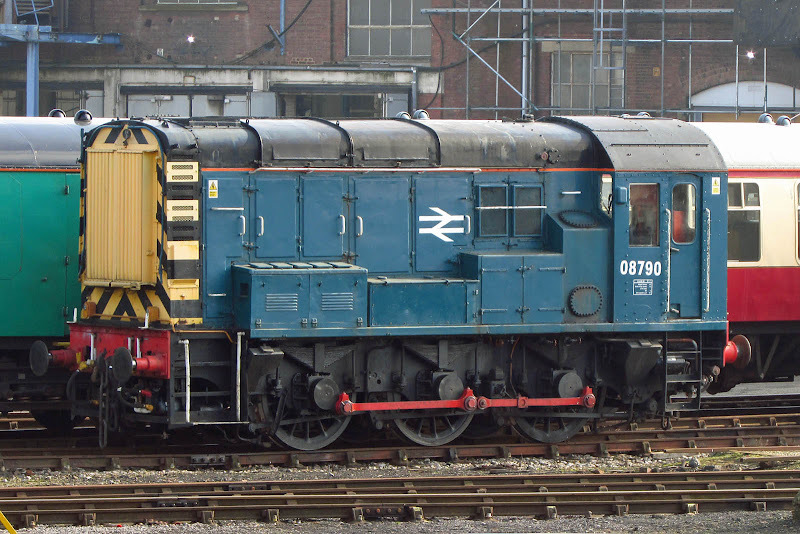 70809 came off, the 60 then added some further empties, and proceeded to Whatley. 16:37 - departing for Whatley. 60054 does not seem to have been out to play much at all this week, the only pictures I can find are at Whatley on Sunday 5th. 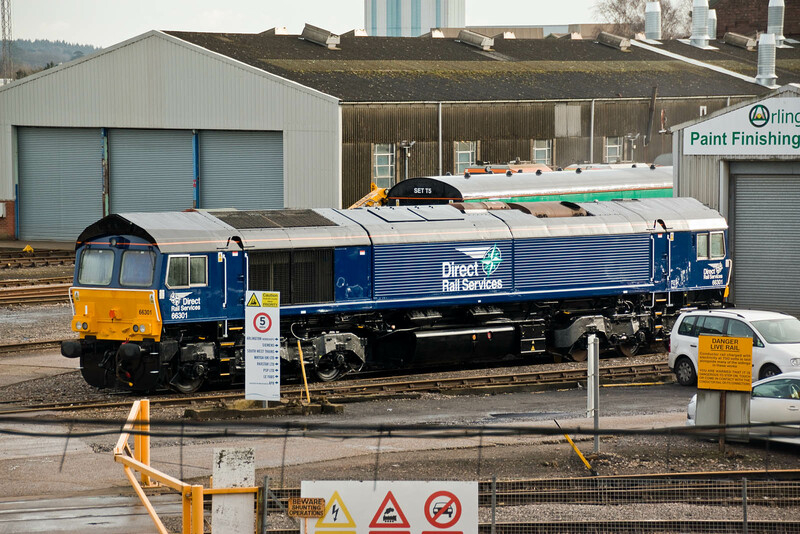 70013 has been reinstated to pool DFGI (Freightliner Intermodal Class 70) but as of Wednesday was allocated to 'CL08' at Basford Hall. 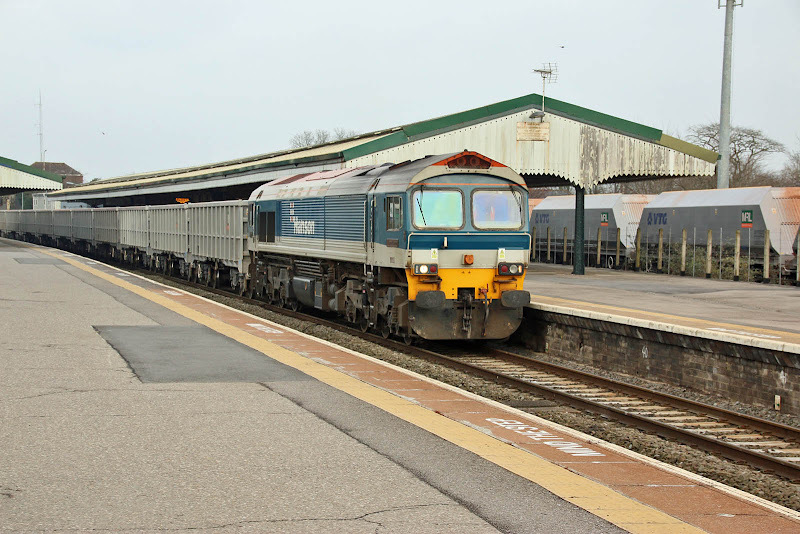 70803 is understood to be under full repair at Laira. 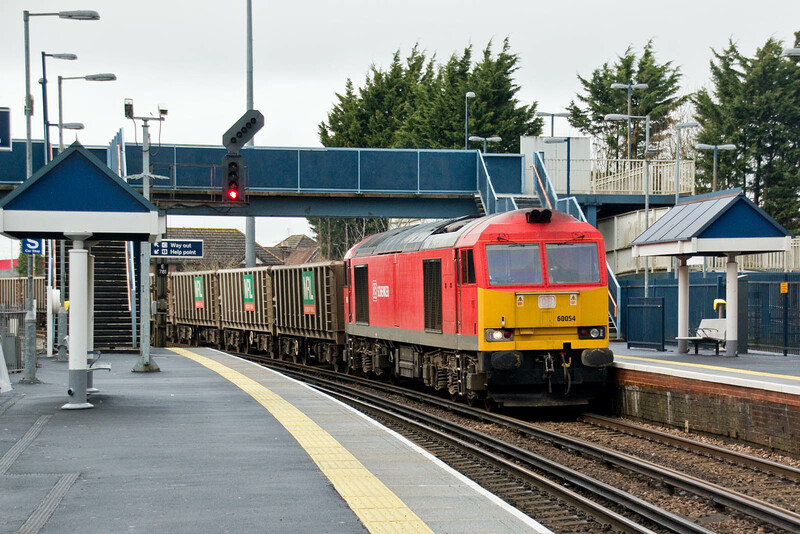 Hamworthy Stone was 59103 on Wednesday and 59204 on Friday. 70018 with 4O29 08:20 Basford Hall-Maritime on 28th January. 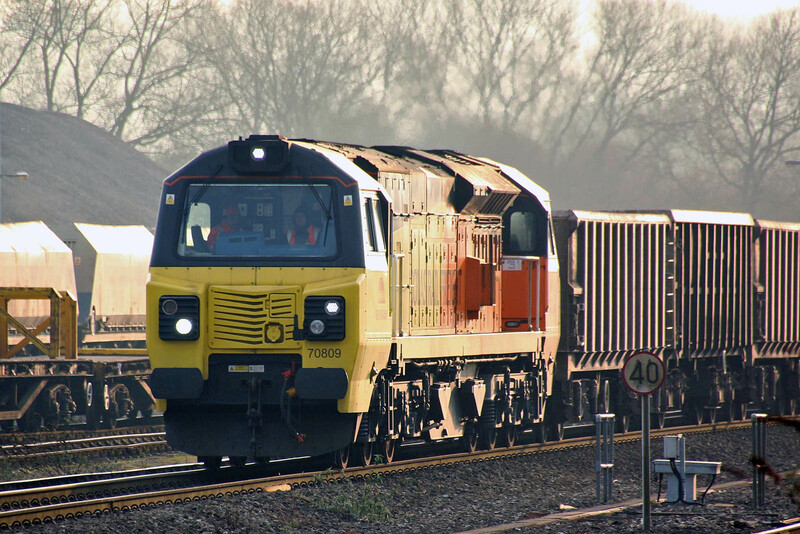 70016 leads 4O90 05:27 Leeds-Maritime on 4th February. 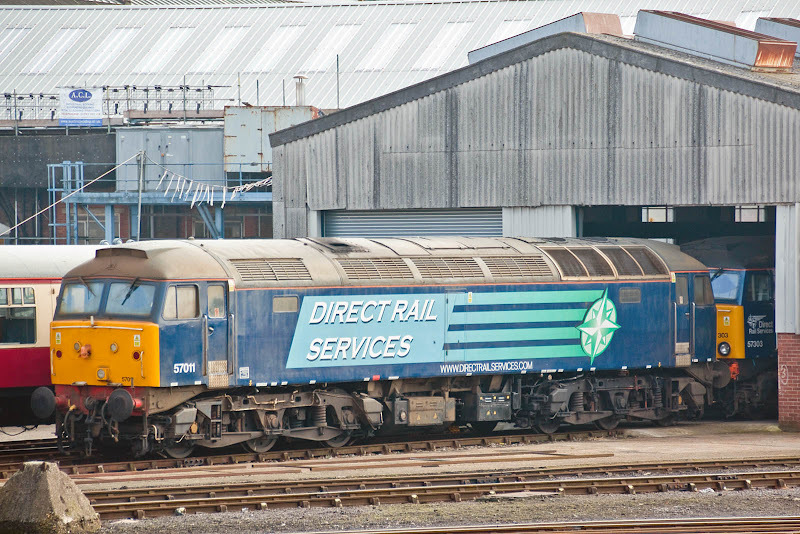 66301 has been repainted and appears to be ready for return to DRS. New to FastLine in April 2008, to DRS in 2011. KTA GERS 97743 and 47818. Internal User 25T Weltrol ADB 900929 (probably Swindon 1960) and a Sulzer 12LDA28-C carcass from a Class 47. 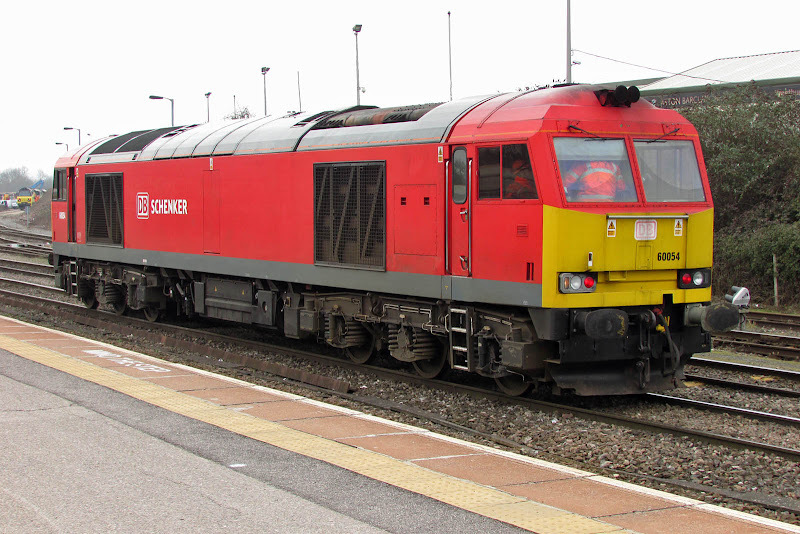 Stored 70013 has been sent from Leeds to shunt at Crewe Basford Hall. 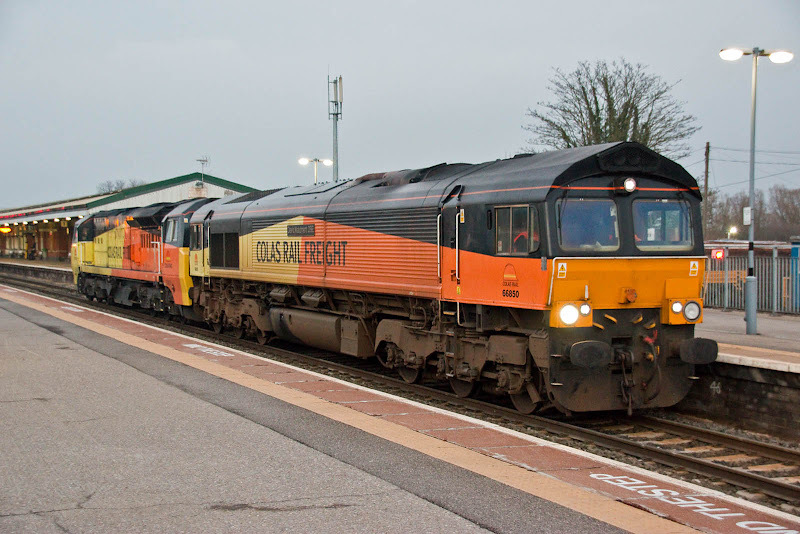 One week after its resumption, Westbury nicely turned out 60054 on the Hamworthy Stone. 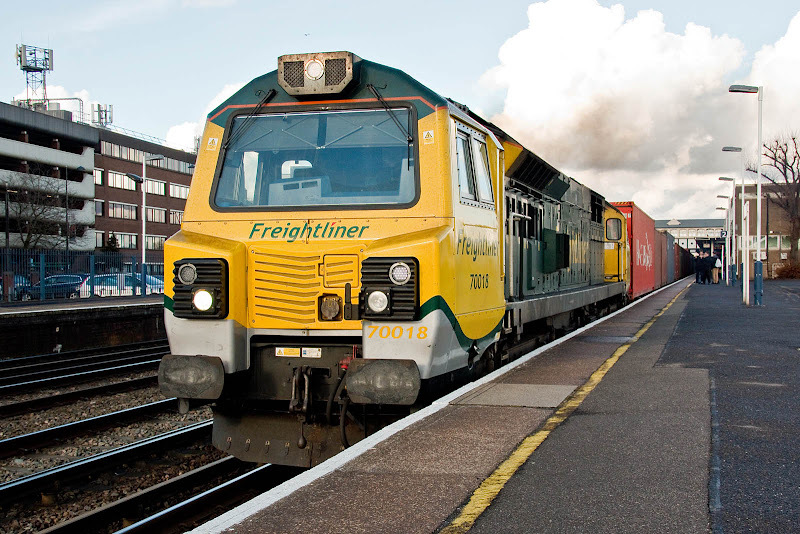 6O51 05:00 Westbury - Hamworthy, 6V52 12:05 Hamworthy - Whatley, both STP schedules on this occasion. 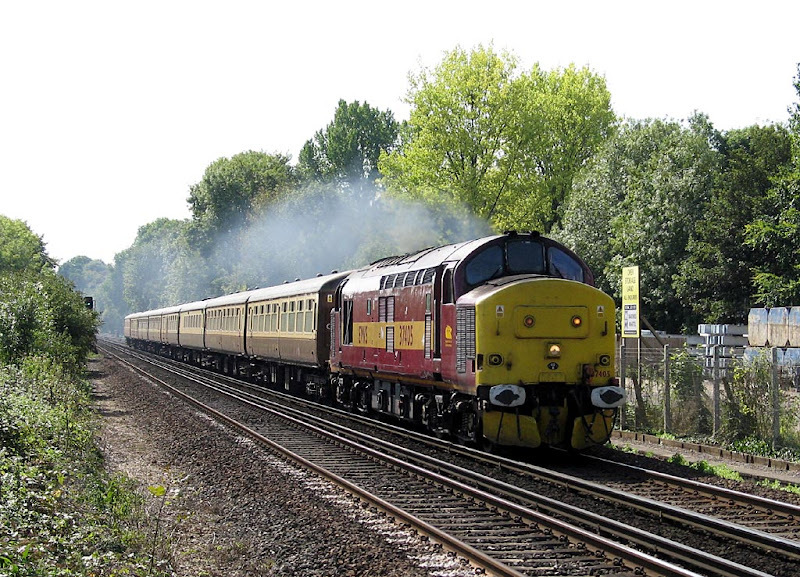 The return run passes Redbridge. 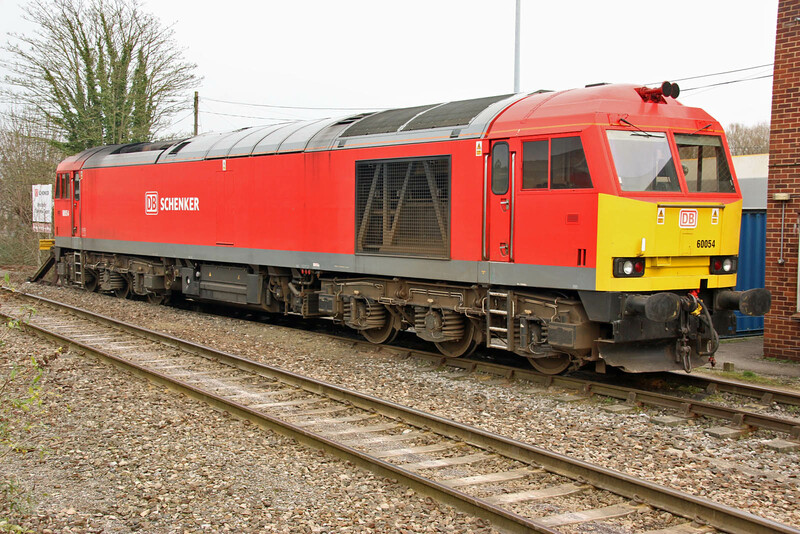 60054 was new in May 1991, and had its 'Super 60' overhaul completed on 20th October 2011. Subsequently it has spent time in store, briefly in March 2015, then again February - July 2016. 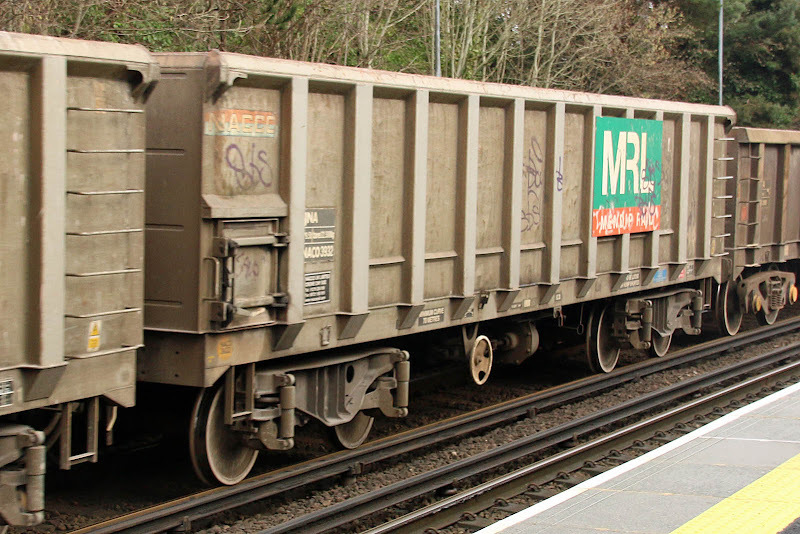 NACO 3932 is a JNA Bogie Box wagon built by Marcroft at Stoke in 2000-01. 90 minutes or so later, passing through Romsey. 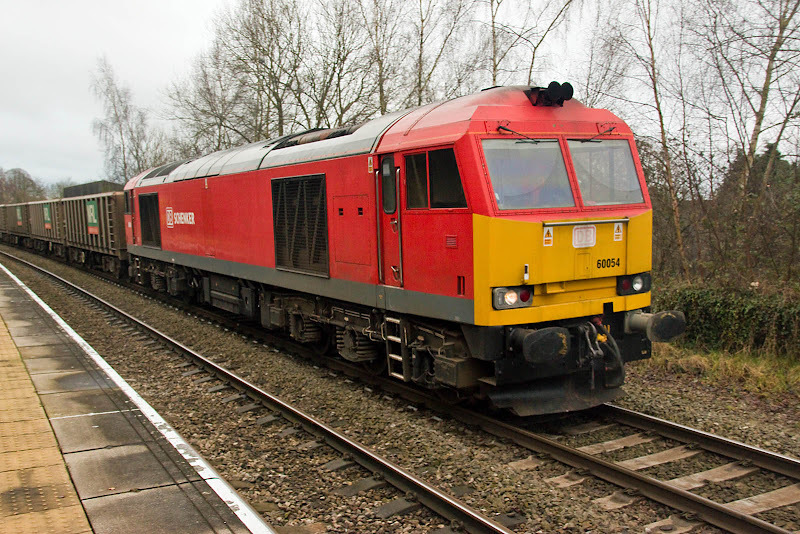 60054 was originally named Charles Babbage and I even have some mileage behind it from Hooton - Liverpool, in 1997.